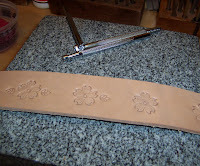 I've spent the last few days working on Tooled belts. 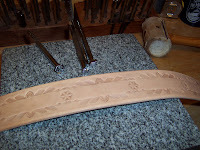 The tooled impressions are much deeper and cleaner if you have an unyielding surface under the leather -- I have this piece of granite that I call Big Block. It works exceptionally well for what I do, but you wouldn't want to drop it on your toes! 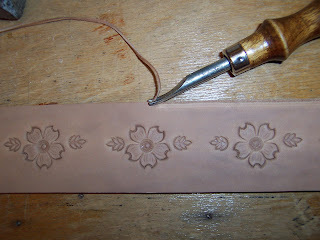 Water is used to moisturize, or case, the leather so it will take an impression. Then I choose stamps from the racks you see behind Big Block and start pounding with my 12oz rawhide mallet. The stamps can be arranged into an almost infinite variety of patterns. Geometric and floral designs are a mainstay in my inventory. 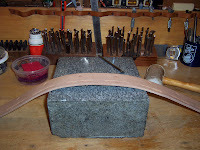 Lots of pounding -- most of my tooled belts are impacted hundreds of times before they're done. I like the flow of a complex design! Some are a bit more understated, like this flower chain I'm building. When I'm working on a pattern I can see (in my mind's eye) what it will look like once it's dyed and that often affects the progression of the design. Two more steps add to the "finished" look of the belt before I let it dry -- a beveling tool is used to take the corner off the edge and then the entire edge is compressed by rubbing it briskly with a hard plastic disk called a slicker. Last but not least, of course, is color! I use a top-quality professional Oil Dye for the black and brown, usually 2 coats. For the bright color I get great results using ceramic-grade acrylic paint. 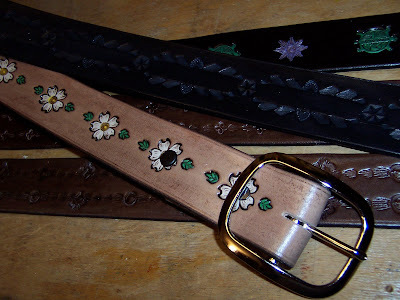 Some highlighter to enhance the designs, my own secret 3-layer finish and a quick buff with my trusty shoe brush, then holes, snaps and buckles and I now have a pile of belts! No doubt about it -- there's something very satisfying in any creative endeavor! Even after all these years, I love when my leather shipments arrive. 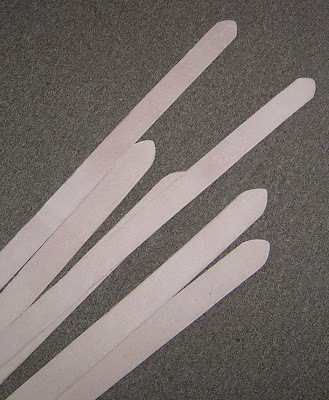 The smell of fresh leather is overpowering to some; to me it's the aroma of possibilities. I order my belt leather by the side, which is basically half of a hide. There are other cuts available, but for ease of handling and direction of grain, sides are my preference. Rolled out, this one measures over 7 feet in length, obviously more than I'll need for belts. 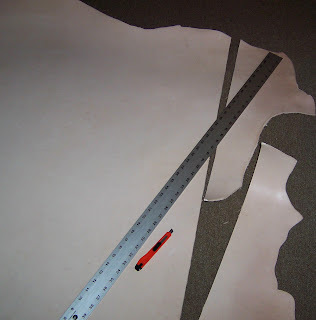 The first thing I do is determine how much excess length there is and cut it away -- the end piece will go into other projects. Then I line up and cut a straight edge with simple tools -- a metal straight-edge and a sharp utility knife. 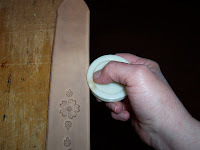 The next tool is a basic manual strap cutter. 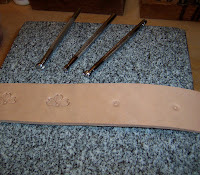 Today I'm cutting wide belts, so i have it set to 1 1/2" for some of the straps, 1 3/4 for others. A quick pull down my straight edge and a belt strap falls away. Then another and another until there's a pile of straps and no side! I cut them to length, trim the tips and I'm ready to go! 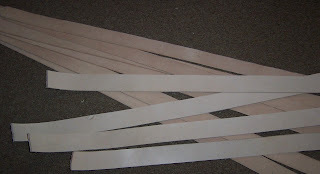 There are few things more exciting to me than a pile of ready straps waiting to become belts; the equivelent of an artist's blank canvas, I'm sure! I'll take pictures of some as I go, so be sure to check back in a few days to see what becomes of this former side of cowhide. Hope your day is as fulfilling as I know mine is going to be! 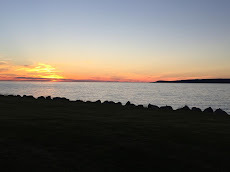 I love travelling north in Michigan. So much forest and water, so many hills... always a pretty journey. 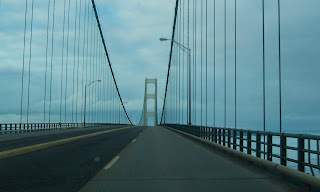 Crossing the Mackinaw Bridge into the Upper Peninsula feels like a homecoming of sorts -- it's my favorite part of the State! 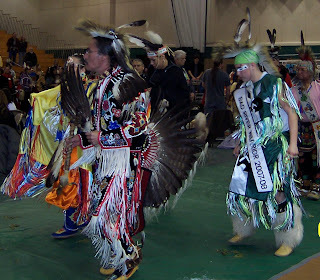 Several hours of driving over more hills and through more forest brought me to Marquette and the Powwow. The drums and the dance never get old! Lots of folks from the UP, Wisconsin and Canada made the journey as well. I should have used the "sport" setting on my camera... those dancers really move! A friend of mine kept me company for the weekend and we sure did have fun! She's a hoot, and even her broken ankle didn't keep her from dancing in the Veteran's Honor Dances. I have a special love of the small dancers -- check out this little guy in his too-cool blue flame regalia! Yup, I had fun! 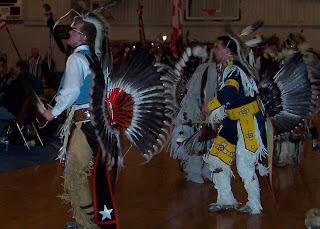 I went to a Powwow in Owosso, Mi. this last weekend and had a wonderful time! It's so good to shake off the winter blues, and seeing all the dancers in their beautiful regalia keeping rhythm with the drum was exactly what I needed! 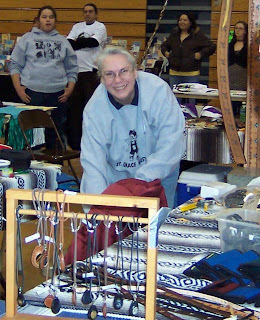 Of course, one of the best things about going to powwow is catching up with all of my friends. 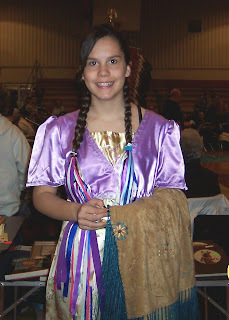 Theresa, a young dancer i met at this powwow last year, was there. She's taller than last year, lol, and was wearing a lovely new outfit that had recently been gifted to her. This charming young lady is definitely a dancer to keep an eye on! For now I must get back to work! I have another powwow to attend this coming weekend in Marquette... next week I'll have pictures from that event; make sure to check back! Okay... lol... tongue out of cheek. 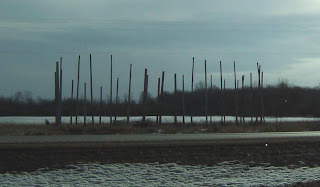 I've driven past this once-started, never-finished structure hundreds of times over the years while driving along Hwy 127, and I've always laughingly referred to it as Polehenge. I was surprised and very amused to find out recently that I'm not the only one who calls it that. In fact, mention "polehenge" to almost anyone who regularly drives that stretch and chances are good they'll know exactly what you're talking about! 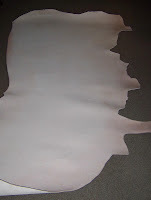 I'm going to digress from leather today and tell you the haunting legend of the Apache Tear Drop. It involves a party of Apache Warriors who fought bravely against an enemy that outnumbered them and had greater weapons. Driven to the top of a mesa bluff and with many of their number already killed, the remaining warriors knew they faced utter defeat and capture. Refusing to surrender their fate to the enemy, the warriors threw themselves off the cliff to the rocks below. Their women shed many tears for many moons until the Great Spirit took pity on them and bade the volcanoes to release tears that would last through time. These stones are those tears. When held in the palm of your hand, the stone appears to be black. When held to the light, they reveal the translucent tear of the Apache Women. The Apache Tear Drop is a specific form of black obsidian, a type of volcanic glass. Formed by rhythmic crystallization that produces a separation of light and dark materials into spherical shapes, it is found in Arizona and other parts of the US. They are said to bring the bearer good luck and remove their tears. 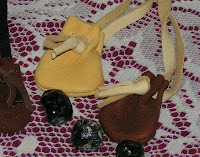 Carried in a pouch or pocket, it is believed that they can balance one's emotional nature and enhance psychic powers, offering protection against being taken advantage of by helping illuminate that which is hidden from the conscious mind.